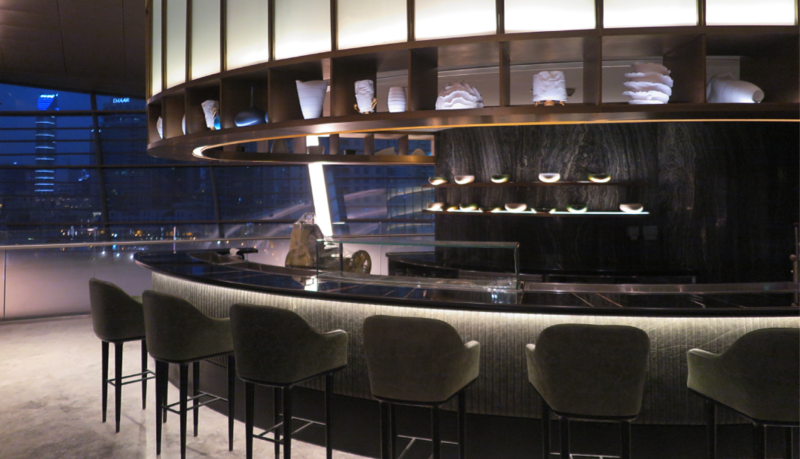 Situated at Roof Garden level, overlooking the fountains of the Burj Khalifa, this 340 cover, stylish and fashionable brasserie was created from a 20,000 sq ft shell and core within the magnificent dhow shaped Dubai Opera House. With strong influence from Dubai’s Pearl Diving heritage an “oyster shell” vaulted ceiling spans the entire width of the restaurant, dressed in a mother of pearl effect herringbone tile, deep sea blue bamboo silk carpets, silver grey marble floors, luscious pink leather banquette seating and nautical brass fittings which all combine to create a stylish themed environment. Offering full collaborative support with extensive choice of marble from our workshops, selected timber materials from our joinery factories, and custom fabricated metalwork, and glass from our in house facilities we created a number of complimentary yet individual entertainment areas, including central Pearl cocktail bar, Fire Bar, and Raw Bar, Chef’s table, Private Dining room, and large exterior landscaped terraces. All areas were templated, with full size samples prior to manufacture in a limited timeframe to ensure that all the requirements of the developer, and operator were met. The project was spatially complex with significant construction and logistical challenges, including the integration of all new MEP services, HVAC and new Fire and Life safety systems, craning large air handling units through the roof, and restricted working hours due to daily performances of the Opera house.